Lorenzo Gomez, III, the sixth of seven children, began his career as a bagger at the Handy Andy grocery store in San Antonio. But, thanks to his intuitive business skills, he quickly moved up to the Holy Grail of grocery stores: H-E-B. Today, his resume includes CEO of Geekdom, cofounder of the 80/20 Foundation and Tech Bloc and much more. But his business acumen didn’t come from a classroom; it came from a surefire combination of real-world experience and the lessons he learned growing up under his parents’ roof. Part memoir, part do-it-yourself guide for professional success, The Cilantro Diaries brings together Gomez’s best business advice in a book that is both entertaining and packed with sage insights. Too many business books are filled with reflections and anecdotes that feel more like lectures than anything, but The Cilantro Diaries doesn’t take itself quite so seriously. Gomez combines workplace wisdom with humorous and sometimes self-deprecating stories of lessons learned the hard way, both in the office and at home. Beginning with the list of household rules that guided Gomez through adolescence (entitled “The Nine Fundamental Life Principles of Pops” and including “Marry a girl who would live with you in a cardboard box” and “Nothing good happens after midnight”) and moving through his own list of twelve career-focused principles, the book offers gentle lessons and actionable advice on every page. Young professionals will appreciate the book as a clear-cut road map into and through their early careers, and seasoned professionals will enjoy the inside look at an accomplished business leader’s journey to the top. Sarah Weber is the editor of Texas CEO Magazine. 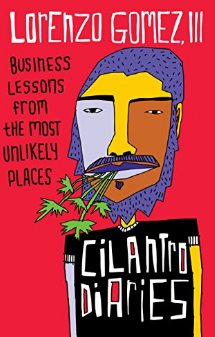 The Cilantro Diaries: Business Lessons from the Most Unlikely Places is published by Lioncrest Publishing and is available through Amazon.